We offering Daily Drink specials Sunday-Friday. We offer catering package meals for groups of 10 and more. Check out our catering menu at www.meatballs.com. Some of the most memorable meals happen when good friends come together to share delicious, freshly prepared food in a setting filled with warmth and fun. That’s the kind of experience that inspires every dish on our menu at Spaghetti Warehouse. 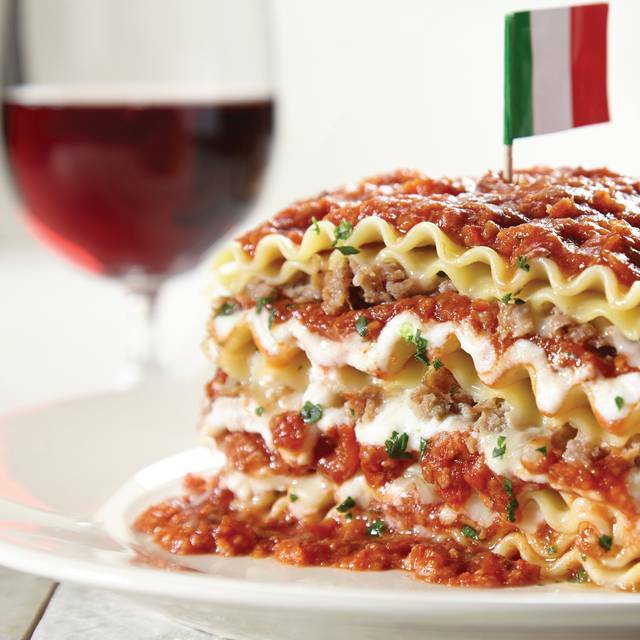 No wonder our Guests keep coming back for so many Spaghetti Warehouse specialties, from Our Incredible 15-Layer Lasagna to Spaghetti & Meatballs, Beer Chili to Fettuccini Alfredo, Chicken Parmigiana to Spicy Shrimp Al Fresco Pasta. And with every entrée, we also serve hot sourdough bread accompanied by our crave-able garlic butter, plus your choice of our Bottomless Garden salad or savory soup. Served Monday–Friday 11 am–3 pm. Served with choice of garden salad or savory soup. Substitute Beer Chili or Caesar Salad for an additional $1 each. Our all-time Guest favorite! Layer after layer of lasagne noodles, meat sauce, Italian pork sausage, ground beef and Romano, ricotta and mozzarella cheeses. Made by hand daily and topped with more homemade meat sauce. Spaghetti topped with more house-made sauce with beef, pork, onions, Romano cheese and tomatoes. Traditional or spicy. Spaghetti tossed with sliced pepperoni and tomato sauce. Topped with mozzarella cheese and oven-baked. Pasta with our beef and beer chili with cheddar cheese and onions. Choice of Marinara, Tomato or Garlic Butter Sauce. Spaghetti with meat sauce with hand-rolled meatballs, sweet Italian pork sausage and garlic bread. Hand-breaded, crispy chicken breast topped with made-fresh-daily tomato sauce and melted mozzarella. Served with our Spaghetti with tomato sauce and fresh basil. Spaghetti with two sweet Italian pork sausages in classic tomato sauce. Spaghetti topped with hand-rolled beef and pork meatballs and covered with more made-from-scratch tomato sauce. Succulent grilled shrimp atop tender fettuccini with our house-made creamy Alfredo sauce. Grilled chicken breast atop fettuccini with Alfredo sauce. Creamy rich Alfredo made with Romano cheese and a hint of garlic tossed with fettuccini. Take It to the Next Level: If you can handle it, add your favorite Warehouse Trolley Sidecars and loosen your belt! Make It a Feast^ $3 Includes 2 meatballs and an Italian sausage. Served with house chips. Substitute fries for additional $1. Add soup or salad for additional $1.50. Fire-grilled 7 oz. beef patty under a tower of mozzarella, house-made tomato sauce, hot Mozzarella Fritta and crispy pepperoni. Hand-breaded crispy chicken breast topped with tomato sauce, fresh basil and melted mozzarella cheese. Served on a garlic-brioche bun. Grilled 7 oz. ground beef patty topped with melted provolone and lettuce, tomato, red onion and basil pesto mayonnaise. Served on a garlic-brioche bun. Herb-marinated grilled or crispy chicken, provolone cheese, lettuce, tomato and red onion served on a garlic-brioche bun with basil pesto mayonnaise. Hand-rolled meatballs topped with house-made tomato sauce and lots of melted mozzarella. Served on a classic toasted Philly roll. Add soup or salad for additional $1.50. Topped with Italian sausage, red onions, red and green bell peppers over our house-made tomato sauce and covered with mozzarella cheese. Spicy pepperoni over our house-made tomato sauce and topped with mozzarella cheese. Grilled chicken breast over our spinach artichoke spread, topped with mozzarella cheese and garnished with our house-made bruschetta. Godiva® Cheesecake baked with chunks of milk chocolate topped with rich chocolate mousse, chocolate ganache, and chocolate whipped cream. The Cheesecake Factory Bakery® deepest, richest chocolate cake baked with dark chocolate chips, layered and topped with a decadent chocolate black-out icing. Finished with almonds and magical chocolate rosettes. The one and only classic cheesecake that started it all. Creamy and oh-so-rich (we are not kidding) cheesecake with a graham cracker crust. Reese's® Peanut Butter Cups combined with The Cheesecake Factory Bakery® rich cheesecake, topped with chopped Reese's® Peanut Butter Cups. Experience a "Taste of Italy" with this moist vanilla cake filled with Italian vanilla cream mousse with a hint of fresh lemon. Finished with a sugary and buttery streusel topping. Featuring the "Best" of everything The Cheesecake Factory Bakery® offers, they are sure to be your favorites too! Signature Black-Out Cake topped with chocolate cream cheese icing. The Cheesecake Factory Bakery® Southern style red velvet cupcake with rich cream cheese icing. Can't decide on which mini-cupcake you want? Try one of each, including Chocolate Black-Out, Vanilla Bean and Red Velvet Mini-Cupcakes. *Caution: Consuming raw or undercooked meats, poultry, shellfish or eggs may increase your risk of foodborne illness. ^Signature Dish. Sunday, May 12th, Celebrate Mother's Day with Spaghetti Warehouse. Treat Mom to her favorite Spaghetti Warehouse Entree and we'll treat her to a FREE TAKE HOME GIFT of our Famous Spaghetti & Meatballs Entree! It's all packaged and ready to go into your Mom's fridge for a tasty treat the next day! Waiter, James, was amazing and very attentive. We had to wait 20 minutes for our table, even though we reserved a table, and hostess seemed very overwhelmed. Parking spots were also sold to a concert across the street, and there was no parking for restaurant patrons. For the most it was a great experience. Appreciate the great, speedy service the waitress provided. She made sure we did not need anything at all times. The only direct negative feedback I can give would be your staff did not find the booked reservation. Could not find reservation through reservation confirmation number, nor party name, online lookup, there was no indication of any large party. Luckily it was not busy at the time and some tables were available. I could only imagine what would have happen if there was a packed house. This I must say is Not in any way acceptable. Confirmation was made so the reservation was booked correctly. Reservation at 6:30 but showed up at 6:05 and let manager know. She advised we would be sat soon. 6:45 which was after our reservation and I went back to host stand and they couldn’t find my name anymore. They wanted to give us set menu cause we were a party of 10. Advised we wanted to order regular menu and they said they don’t do that for 10 top as it is too much for server. Party ended up being 9 so they allowed us to order from regular menu. (Set menu is not stated on website nor on this site) when food finally arrived server dropped tray which had 3 entrees, 2 kid entrees and 1 adult. Waited at least 10-15 min to get their food out again. We saw a party of 15 that got their food first before our kids got theirs. Also that party was sat 30 min after we did and they were out before us. We got a lot of I’m sorry’s but didn’t feel genuine like it wasn’t meant. It was my moms birthday and didn’t get the experience we were looking for being that this place is in downtown far from home. I would think something would get comped or my moms desert would be free due to all the mishaps but nothing was comped. Did not leave till 9:50. This should have not been a 3-4 hour experience. Very disappointed in this establishment. Would not recommend anymore. Food portions large ,service great but facility needs a makeover the chairs are old & ripped the tables wobbly. The lighting fixtures were horrible I believe they need to poor some revenue into a make over. And lastly I think the food needs to taste like it looks it taste very bland & commercial doesn't pack any home authenticity. So I personally would not go back. My family enjoyed stuffing themselves it was a good time overall . The food to really long to come out. Our server was all over the place, drinks we wanted were not available, and there was a waitstaff just handing order to our server for another party while he was taking our order. My family was really excited to try this place out and we were disappointed we won't ever go back. I got my mom a gift card to Spaghetti Warehouse because she had very fond memories of taking us there when we were young and she wanted to take my nieces on a family trip. Unfortunately, the service was deplorable - every time our server left, he'd take at least ten minutes to come back, even if the request was something like "can I have a to-go box." Multiple parts of our order came out 15-20 minutes after the rest of the meal, and at least one part (the calamari) was so cold it was not edible. The food itself was mediocre, which was about what I expected, but the service was so bad that it really tainted the rest of the visit. Avoid this restaurant. When we walked in it smelled, the carpet was very dirty, the place in bad repair. We should have left at that point. Seated with very slow service. Ordered some water with lemon - usually lemon can mask the bad taste - not this time. Ordered a glass of wine - hard to mess that up. Ordered the Spaghetti Pomodoro, the dish came with raw vegetables and chopped up spaghetti. I have never had ‘spaghetti’ chopped. I started to wonder if it was leftover meals. The fresh bread seemed good but accompanied by margarine, not butter. Things did not improve. The waitress dropped a plate of spaghetti on the already dirty carpet that thankfully missed my partner. We did not eat 1/2 of our meals. We got up to leave at that point to wait at the front instead of looking at the food on the floor. The Manager came up and offered no remedy. We actually left a good tip to the server because I can imagine it probably stinks (literally/figuratively) to work there. First and last time to ever eat at this place. We made reservations through Open Table for a group of 16. Upon arriving, they said we couldn't have made reservations and that they didn't have them. Then told us that they only had 4 wait staff (on Sunday of Presidents Day weekend and the San Antonio Stockshow). After finding our reservation, They said if they honored our reservation and served us, that they would lose customers and for us to "deal with it". They lost customers all right! We left! Won't ever be back and will tell ALL our friends to never go there. By the way...La Foccacia down the road sat us in 30 minutes and they make Spaghetti Warehouse seem like Chef Boyardee!!! Worst experience with them but they don't have to worry with us ever again!!! I was disappointed that when I made my reservation I specifically said for a birthday. When we got our meal I asked if they would sing Happy Birthday when they brought our dessert for our 13 year old. Not only did they not sing, our waitress brought our bill while we were eating dinner and never asked if we wanted dessert. When I said we were ordering dessert, she seemed annoyed with us. Two large band groups came in after us, but the place seems like they have large groups all the time so that should not have affected us, especially since we were there at 5pm so it wasn't crowded. We went on Valentines night. Service was slow, restaurant was dirty and overall was a bad experience. We won’t be back. In the past I have enjoyed the food however I don't think I will be back. Everyone in our party did not find their meal to be good. A healthier choice with grilled chicken, veggies and pasta with a butter sauce was so full of salt that it could not really be eaten. The lasagna was more like a blob of sauce and not very tasty sauce at that. Overall very disappointed ... way to many options around town, won't be back. Took care of our birthday party and our waiter, Doc, was awesome. Treated us like family!!! Thank you. We were early due to circumstances. We were able to be seated early. We were seated next to a party so my dinner companion had to move to the other side of the table so he would not impede the server assigned to that party. I question the desicion of the hostess on that. That should have been noted and she could have asked if we would have preferred different seating. Our assigned server was as attentive as she could be. The drinks were always full. The time she gave us while we were deciding was wonderful. The food was filled with flavor and freshness. Your GM Pam came to our table and attentive to our comments. For a Friday night approx 630pm with all the music venues in the area i would have expected more of a crowd so i was a bit surprised at how quiet things were. That was actually rather nice though. I would have given 1 🌟 because the service sucked so bad the entire meal. The waiter we had was horrible and needs to be completely retrained. But the manager actually took the time to sit with me and discuss the problems, discuss the upside of the situation, and to also speak of what the remedy of her diligent plan for the waiter was going to be. The waiter came to our table and took our drink order. I asked for sweet tea and he brought unsweet. Then, he wrote down our order which my cohort ordered soup and I ordered salad. He brought us both salad and mine with the wrong dressing. I had to ask a waitress for our correct order because he left so quickly. Then when he brought our meals, I noticed I didn't have a spoon for twirling my spaghetti. So I asked him and he looked at me, then my plate, and said, "it was in my hand, where did it go?" And ran off. Then 5 minutes later, he walked by with a huge tray of drinks, and when he came back, I said "spoon". He says again, "I had it in my hand! Where is it?!" And ran off again. So after asking two more times, I got fed up and asked the previous waitress who finally brought me one. He came back when I was 3/4 finished and DROPPED the spoon on my plate and ran off. Then he had the decency to get upset because I left him a $2.00 tip. So, because the manager was understanding and said she'd fix the problem, I did NOT give 1 🌟. The hostess appearred to be lost. Had to wait 40 min having reservations. It took 15 minutes for our server to take our order and another 10min to bring out drinks. When else got our order the food was cold. We don’t plan on going back anytime soon. We ate there on a Saturday around 1130am for my Mother's 69th Birthday. Shelby, our Server, was excellent and super sweet. Ambiance was very nice and everyone was so friendly. Food was delicious and fresh! The whole restaurant participated in singing my Mother Happy Birthday so that was very sweet! I highly recommend going to Spagetti Warehouse, Have always loved going in there to eat and drink. Great service and food. Reservation was ready on time. Poor hospitality and hostess with bad manger. I stood wait to be greater as well as other personnel. service is too slow, food is good, ambiance is nice, the place has a bad smell. Arrived at the restaurant and hostess did not have my reservation even though I had a confirmation email. She said the manager just did not let her know about it and now my party of four would have to wait 20 minutes to be seated. Why bother making a reservation. We made the reservation because we had tickets for an 8:00 show but this restaurant could care less. I will never go there again nor recommend it to anyone. Yes, I do realize that mistakes happen and people are not perfect all the time but these employees never apologized and did not care one iota. People make reservations for a reason but their system is not working. short staffed, dirty, don't uphold reservations. Very disappointed with management and expectations. the food was good service was ok, it’s bad that they have to ruin the whole experience by doing an ethical behavior of marking no show on OpenTable. We were not very hungry, so the server made an excellent suggestion that we really appreciated. The service here is excellent. I made the reservation for an specific time in the evening, 6:45 pm, because we knew that the place was going to be pack. My family and I arrived on time and it was until 7:45 p.m. that they ended up calling us that our table was ready. They were other people that they were taken in before us and they didn't have a reservation. A family of 7 that we knew were seated first and they didn't have a reservation. By the time they called us that our table was ready my family and I decided to take off from the place. Around 9:20 p.m. I received a call from one of the family members from the family of 7 that I mentioned before and he told me that him and his family were leaving the place because the waitress was rude and never served them the food. Really bad experience. I wanted to love the place. Really. It’s in a really cool old building and has a traincar inside it. However, the food was just mediocre. We would probably still go again just for the atmosphere though. The service was a little strange, but it was okay. Nice place to eat. Great food and good service. Table was set and ready to go with no waiting. Spaghetti Warehouse is a unique place to eat as we drive about 30 miles to go there. A couple of good vegetarian spaghetti plates also. Nothing like it used to be. Didn't have enough bowls for soup and there were only 4 families in the whole place. Took constant reminding that we needed drinks refilled and kept forgetting to bring out food that had been ordered. Server was forgetful and inattentive despite small crowd. My dish had no sauce and my most of our salads were lacking the their dressing. It's not the Spaghetti Warehouse it use to be I miss the authenticity of the spot.